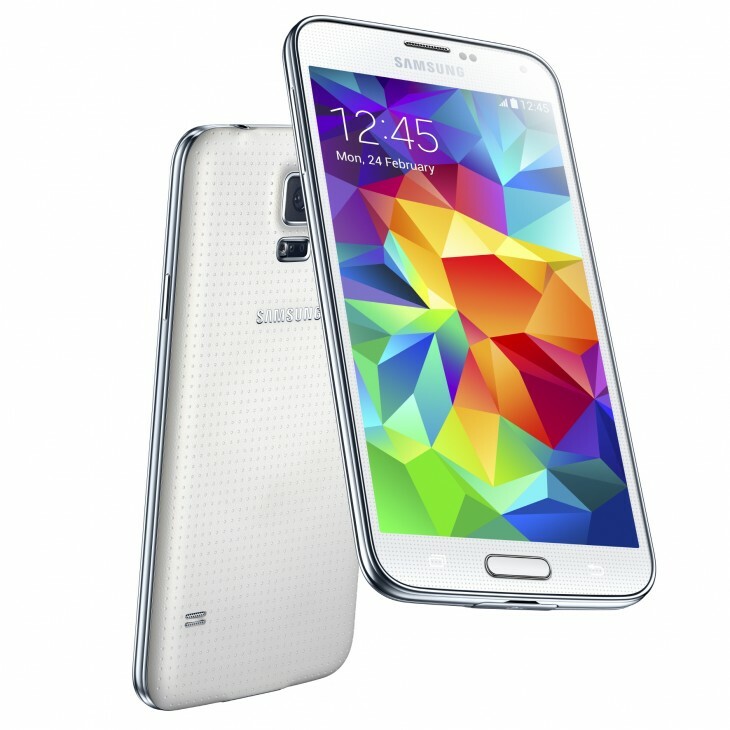 Samsung announced Samsung Galaxy S5 today at MWC 2014. The S5 sports 5.1-inch full HD (1080p) AMOLED display, powered by 2.5GHz quad-core processor or an 8-core Exynos processor depending on the region and paired with 2GB of RAM. Samsung Galaxy S5 powered by a quad-core 2.5GHz processor, 2GB of RAM, a 2800mAh battery and either 16GB or 32GB of internal storage with a microSD card slot for expandability up to 64GB of extra space. Samsung claims the Galaxy S5 offers “the most advanced LTE experience and Wi-Fi performance” of any smartphone on the market, with Wi-Fi 802.11ac and 2X2 MiMo, as well as LTE with Category 4. Galaxy S5 is also IP67-certified, which adds an element of water and dust resistance, the micro-USB 3.0 port at the bottom is protected by a tab that keeps water from getting inside. The Galaxy S5 runs Android version 4.4 (KitKat). The S5 sports 16 megapixel camera, the time spent between shots has been reduced to 0.3 second and the handset now supports 4K video recording and high dynamic range (HDR) processing (both photos and video) and a 2.1-megapixel front shooter. Samsung is introducing a selective focus feature that’s much like Nokia’s Refocus Lens, in which you can change the depth of field on an image after it’s taken. One of the biggest talking points for the Galaxy S5 is that new fingerprint scanner. Samsung’s scanner, which works by swiping your finger down over the home button, has a few handy use cases. In addition to the usual phone unlock option, it also lets you fingerprint-protect a private data locker on your phone, in case you have confidential information you don’t want getting out there. Samsung also announced a partnership with PayPal which allows you to make online payments using the fingerprint method. The other new feature is the heart rate sensor, which is built into the same rear module as the LED flash. It works in conjunction with S-Health 3.0, which acts as a personal life coach of sorts. To monitor your pulse, hold your finger up to the sensor and leave it there while the phone does the rest of the work. As you continue to do this more often, S-Health remembers your history and even goes through the effort of graphing it and offering up other relevant information. The S5 new “ultra power-saving mode” will keep your handset alive by making the screen black and white and turning off all the non-essential services on your phone. Samsung claims if you put your phone in standby mode with only 10% of the battery left, it will still last “up to 24 hours” before running out of power. The Galaxy S5 will be available starting April 11th in 150 countries.